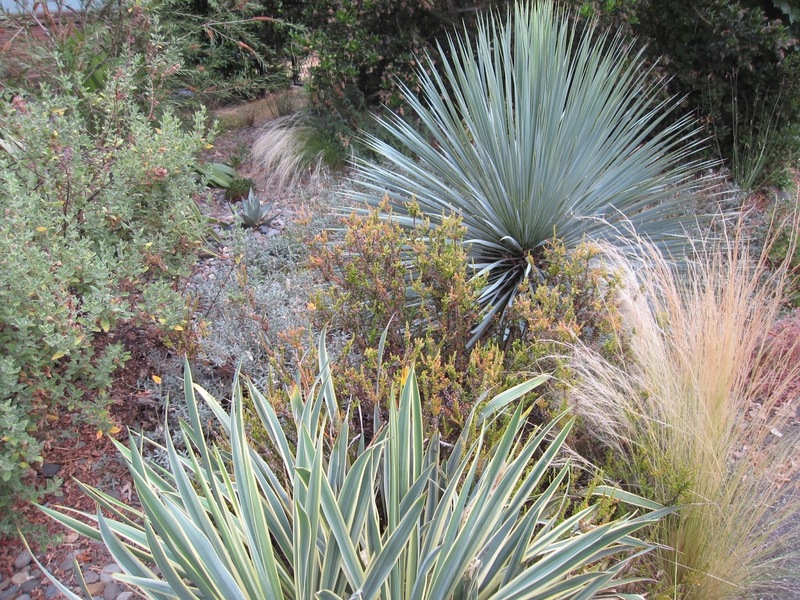 After several periods of record-breaking high temperatures in late June and early July, I'm looking around the garden with a new appreciation for some of the tough sun and heat-loving plants. 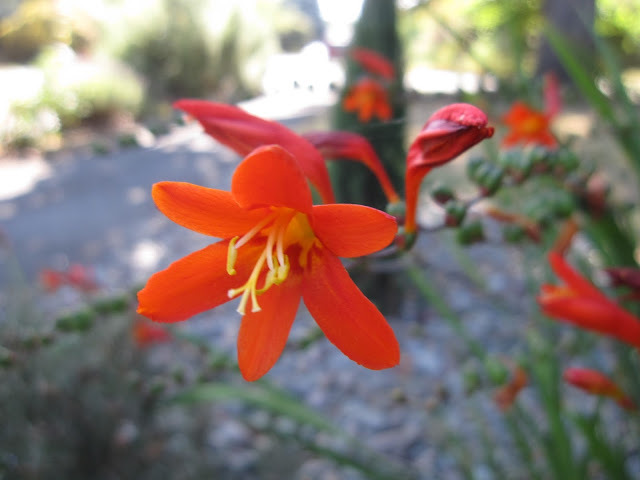 The heat waves have been something of a do-or-die test because we have been away a few times and the garden has had to rely on our watering between trips. Let's see who's still reveling in the heat. 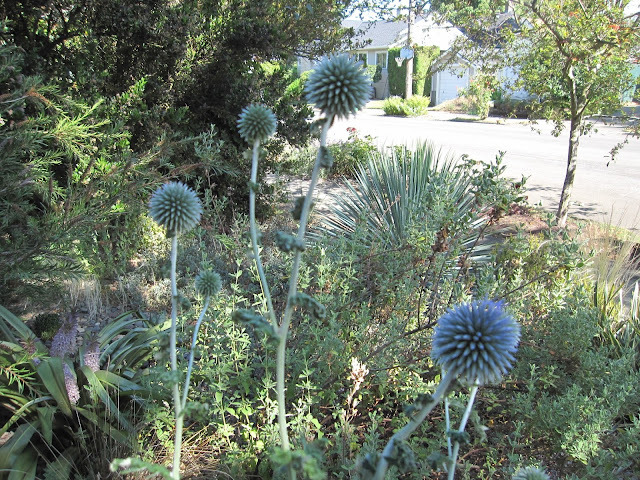 Echinops ritro. 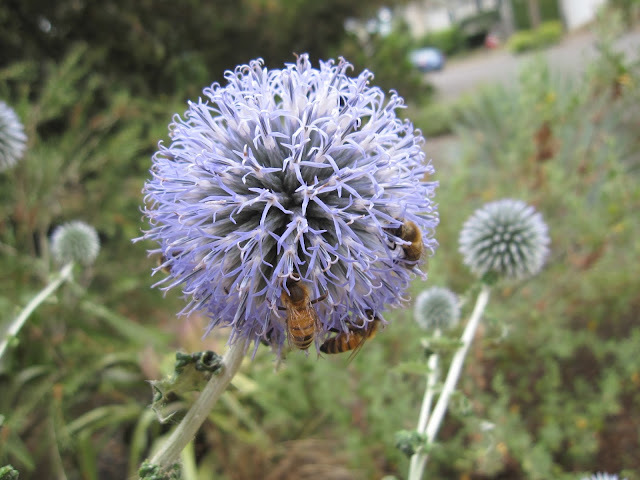 In addition to blooming like champs, they are attracting bees to boot. 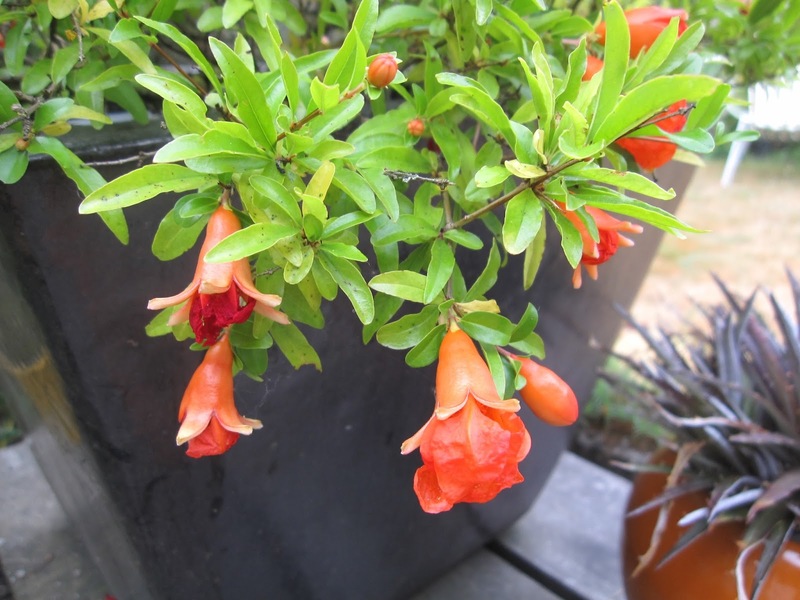 Punica granatum 'Nana' was a little sulky when it dried out, but once watered is blooming profusely. 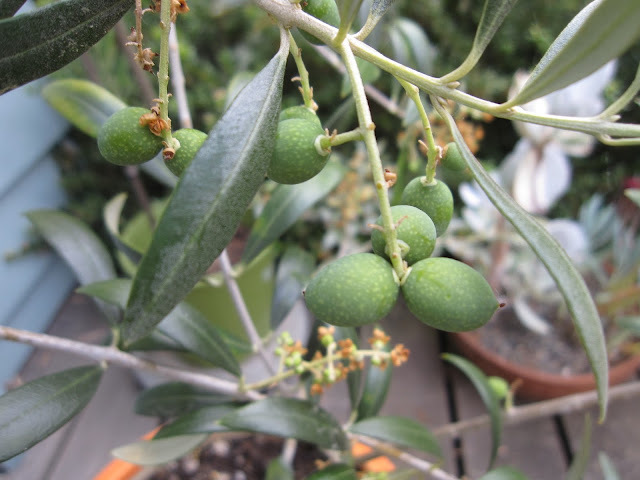 Olea europea 'Arbequina' is making a bunch of olives. Heat lover! 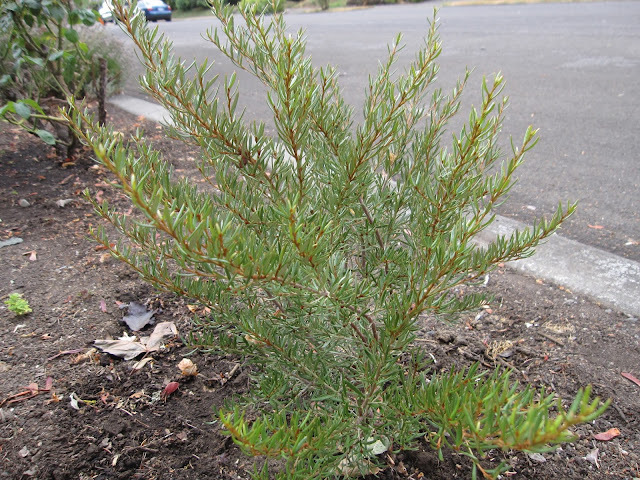 I've been waiting for this Grevillea australis, planted just this spring, to express its thirst. Today I discovered the Mulch Man has been giving it a small amount of water when he waters the roses, but not much. Winner - and so fresh looking! 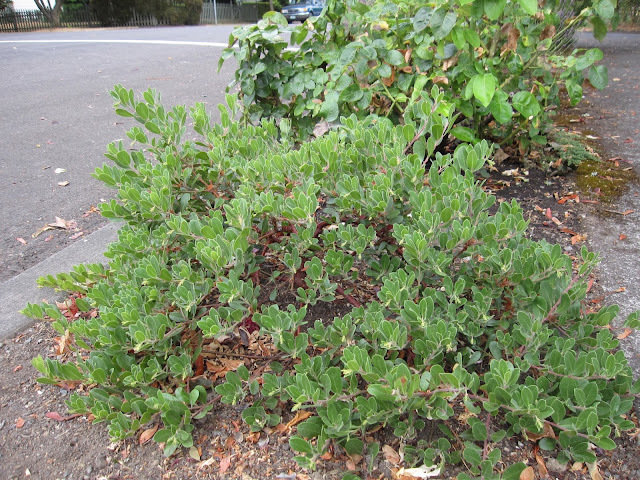 Arctostaphylos: Drought-tolerant: Check! Loves sun: Check! Happy camper: Check! Given adequate water, the rosemary barrels in the driveway thrive in the heat and sun. 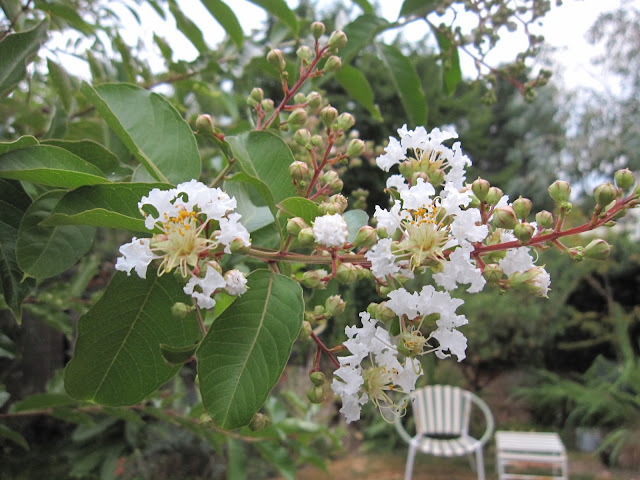 Lagerstroemia 'Natchez' has been getting water, because I want every one of these great white trusses to flower. 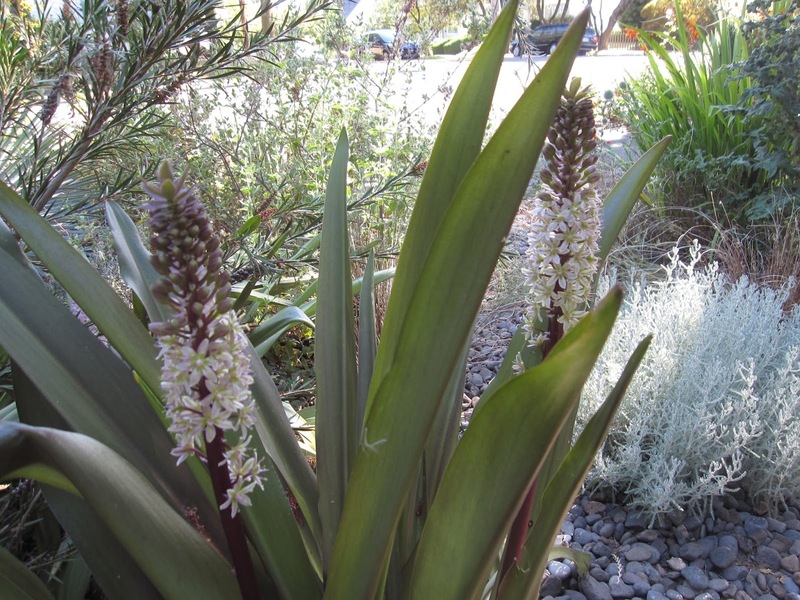 The hot weather is kicking it into bloom almost a month earlier than last year. What grows and doesn't care about water when it's hot? Cactus! 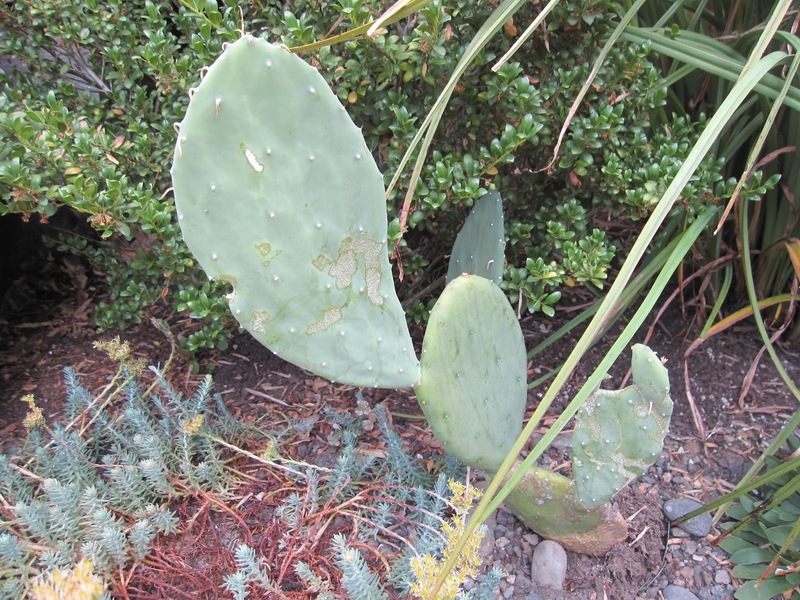 This one (likely Opuntia cacanapa 'Burbank's Spineless") started as a pad from Patricia's former garden that I rooted, then it rooted itself through the pot. Good thing I wanted it where the pot sat. It's a bit nibbled, which begs the question, "Who EATS a cactus?" 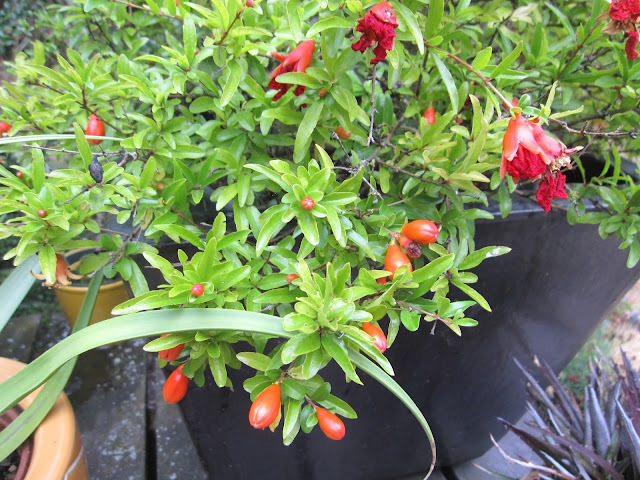 This is our second try at having Ribes sanguineum in the Northwest Territory. 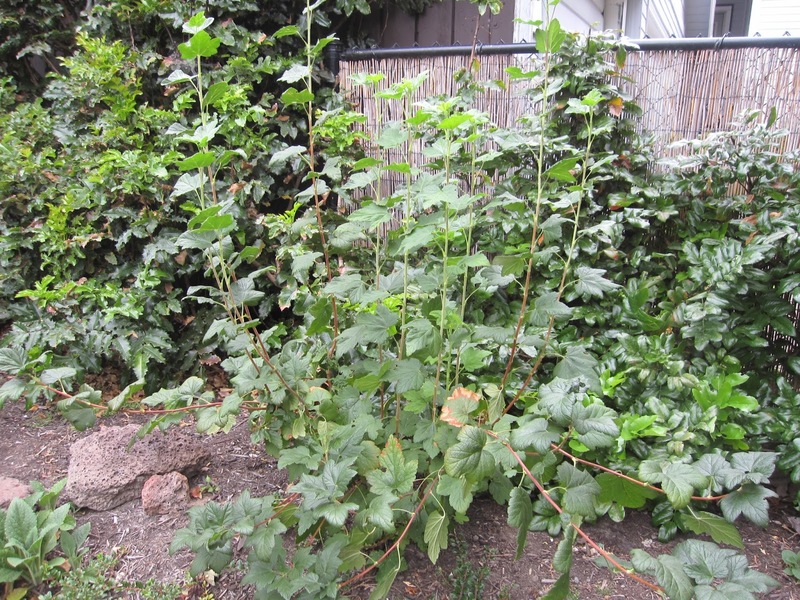 Except for a couple of toasty leaves, it's looking pretty happy with the heat. 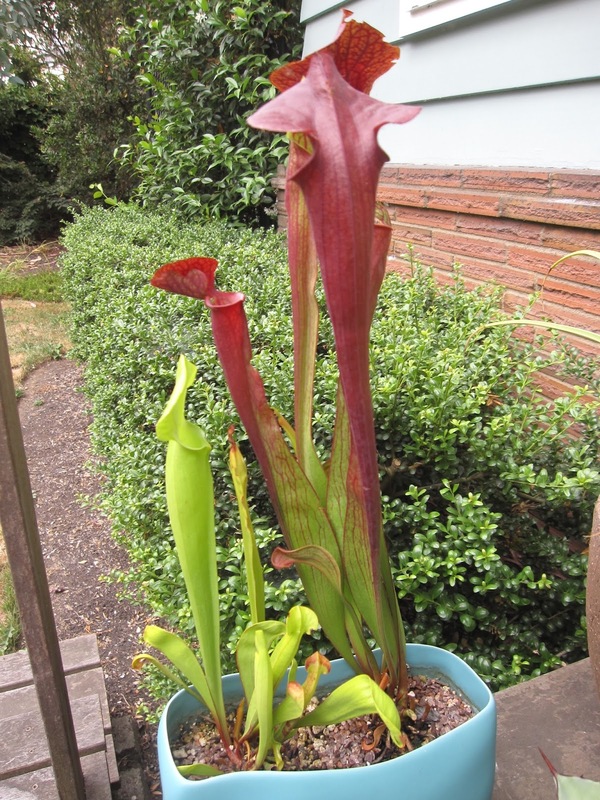 These Saracenia in a pot are soaking up the sun. As long as I keep them wet, they're happy. 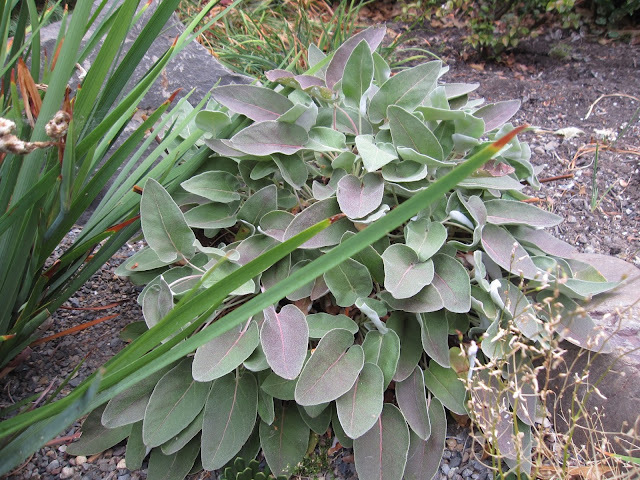 Eriogonum compositum has weathered the heat with aplomb. It seems born to it. 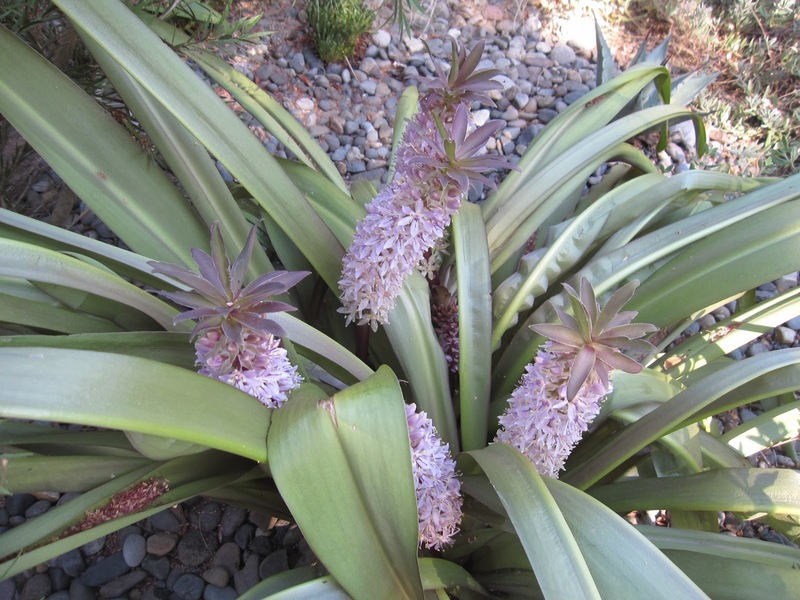 Two Eucomis comosa 'Sparkling Burgundy' snuggle under the Callistemon 'Woodlanders Hardy Red' and together the trio laughs at the sun. But despite the heat, Eucomis pole-evansii on the left didn't bloom this year. 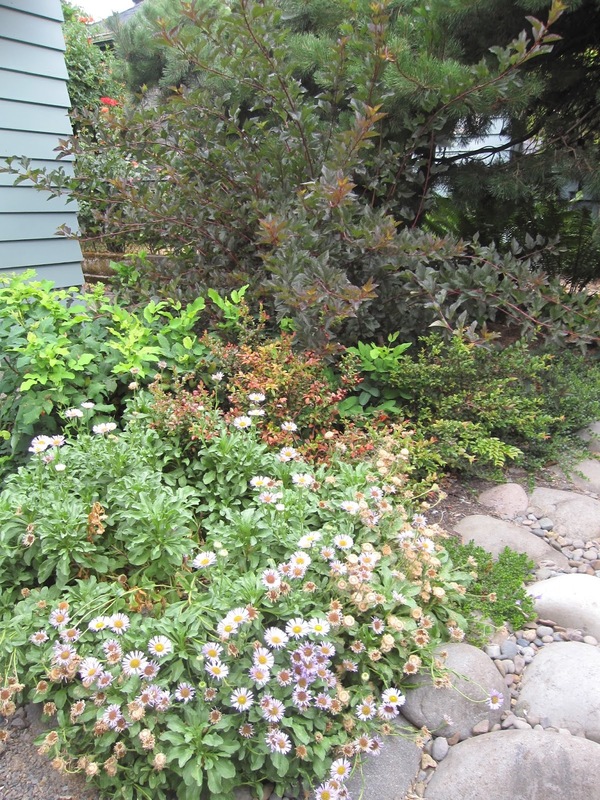 With regular but modest amounts of water, this grouping of Physocarpus opulifolius 'Summer Wine', Mahonia repens and Erigeron glaucas is perfectly happy in the heat. The orange foliage of the Vaccinium ovatum in the center tells a different story: Several of the evergreen huckleberries are crispy from the intense sun on their fresh foliage. The fine foliage of the greener leaves to the right of the burned huckleberry is more typical - and happier. 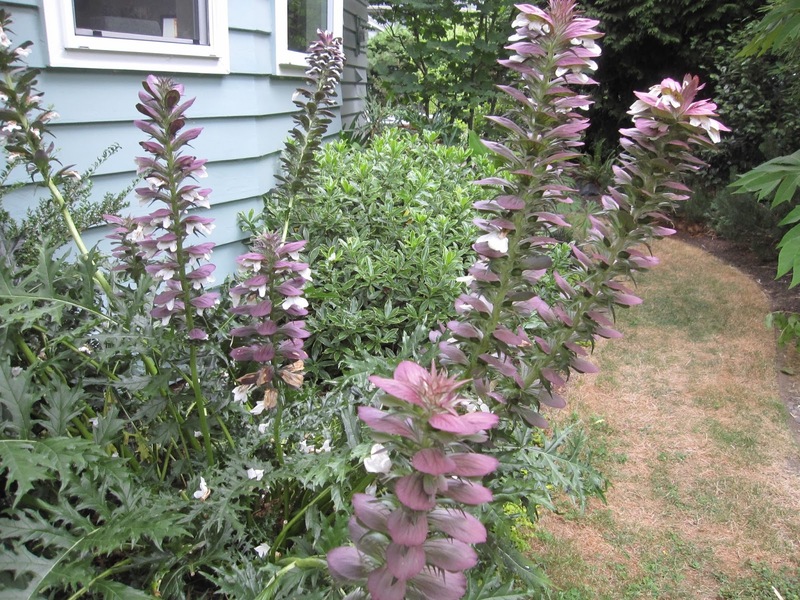 Acanthus spinosa was born to heat and sun. The turf grass to its right - not so much. We have stopped watering the grass in preparation for the patio and path project that begins in less than a month. Say buh-bye to the backyard lawn! I'll leave you with a grouping that was made for the heat. Yucca rostrata, Yucca 'Bright Edge', Halmiocistus wintonensis 'Merrist Woods Cream', an amazing NOID heather that has adapted to the setting, and Mexican feather grass. So bring on more heat: my plants can take it. As for me... after more than 25 years in Portland, I now have my very first air conditioner. 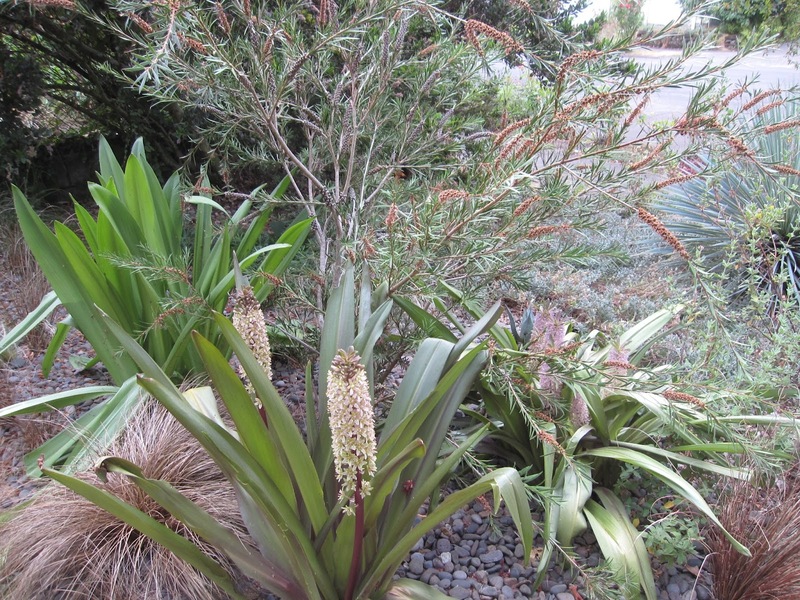 It's only mid-July and already it feels (and looks) almost like late August in the garden. The month of June brought high temperatures with no rain, and now in mid-July we are parched and dry in Portland, Oregon. But that won't stop the blooms, although some are significantly earlier than normal, and many that are almost done were in their full glory this time last year. 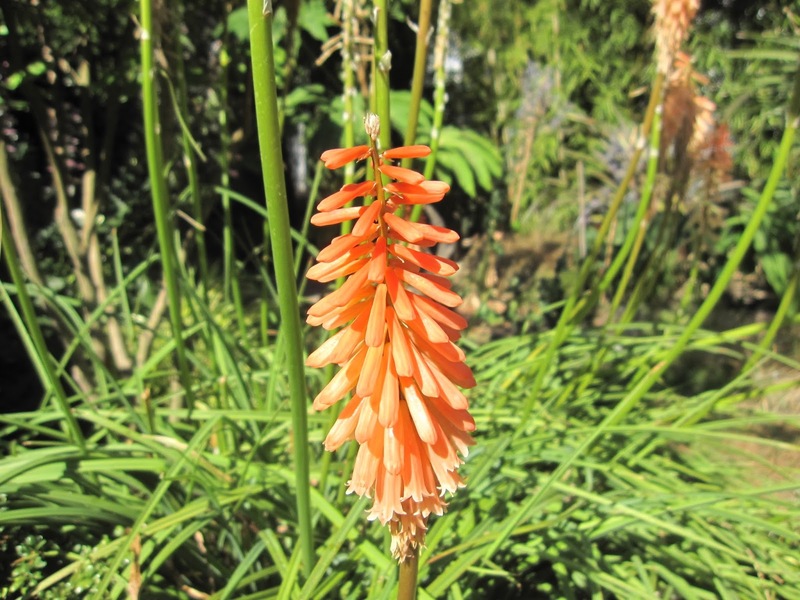 Like Kniphofia 'Timothy', whose salmon-colored blooms have gone from over a dozen at a time to just a few trailers. The hummers are still interested in them, though. 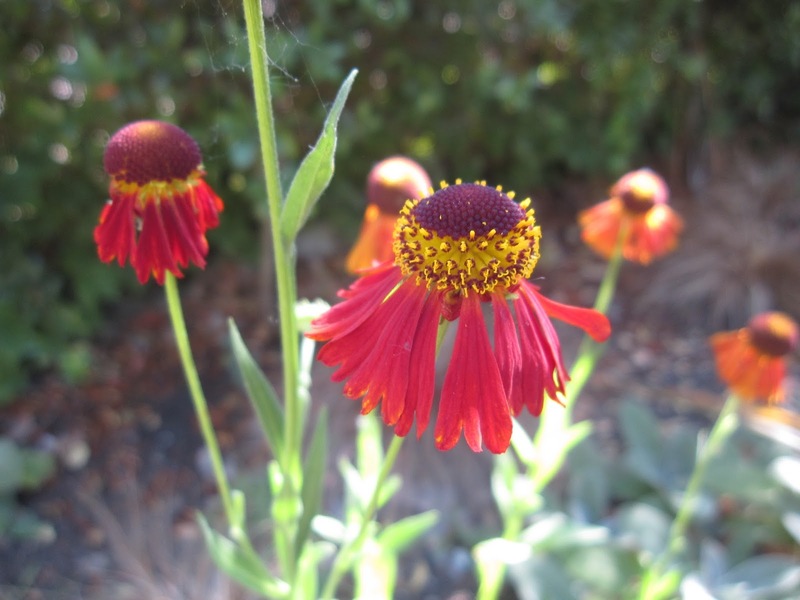 Helenium 'Moorheim Beauty' is not as full this year. It's a plant I rarely water and I think the early drought affected it. 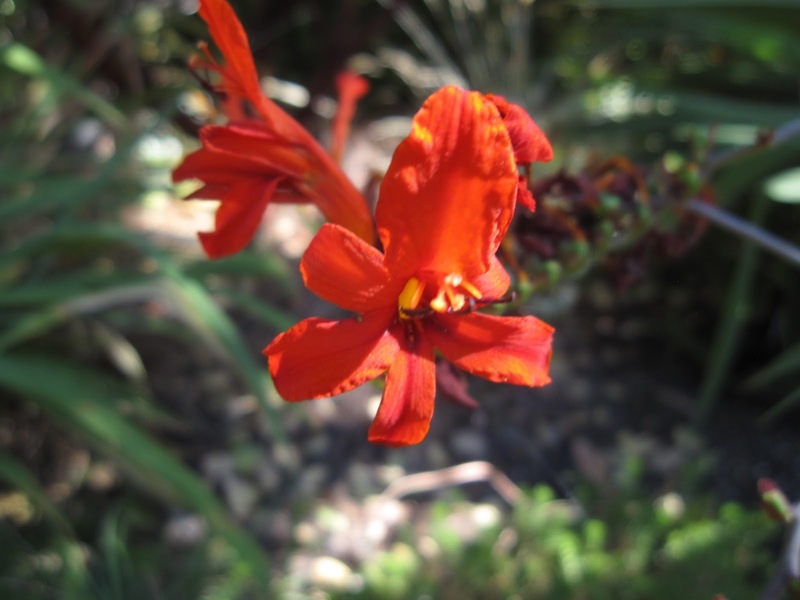 It's the month for Crocosmia. 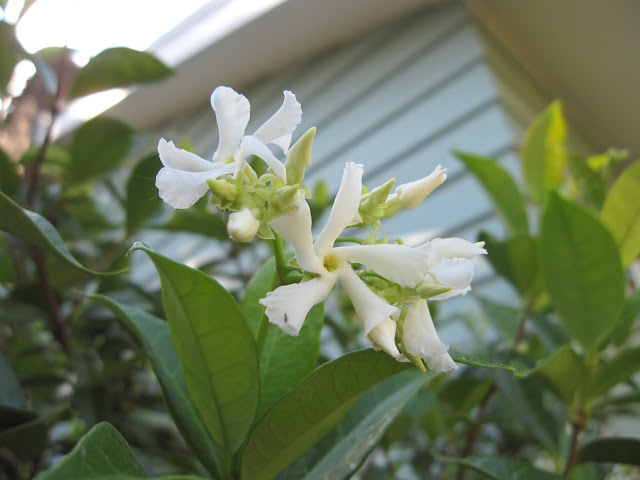 Here, the last flowers on C. 'Lucifer'. 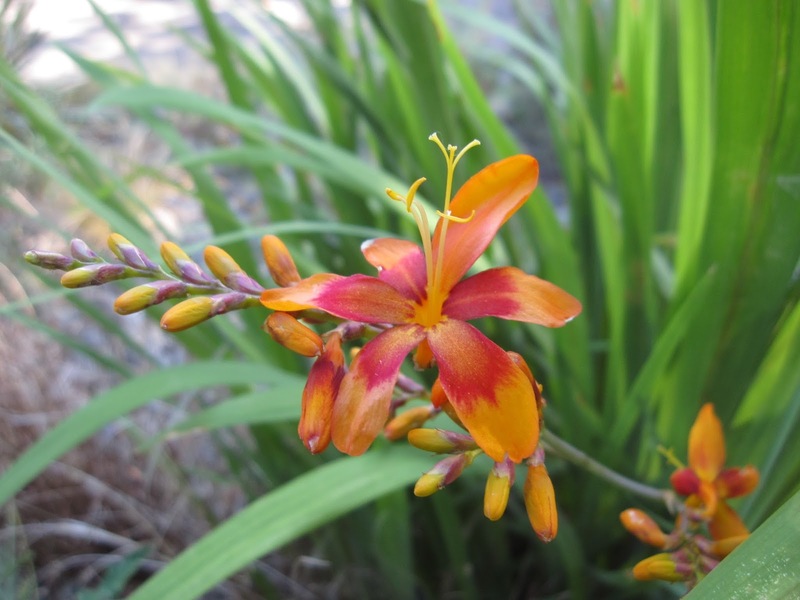 I'm drawing a blank on this Crocosmia. 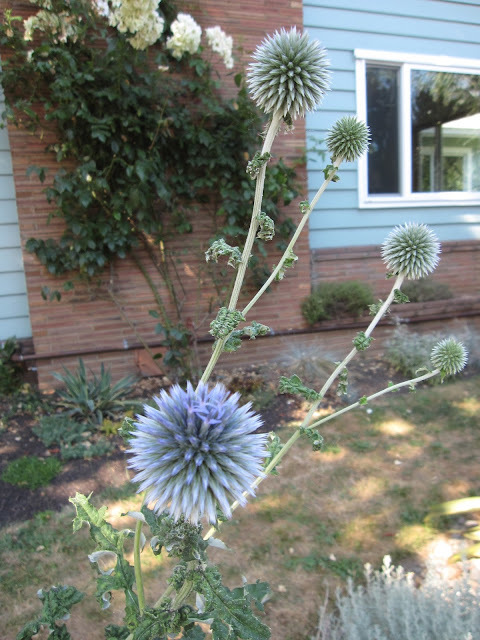 I think I remember moving it last year, but then it didn't bloom. It certainly is a beautiful, clear, tangerine-red this year. - than on this one that gets more sun. 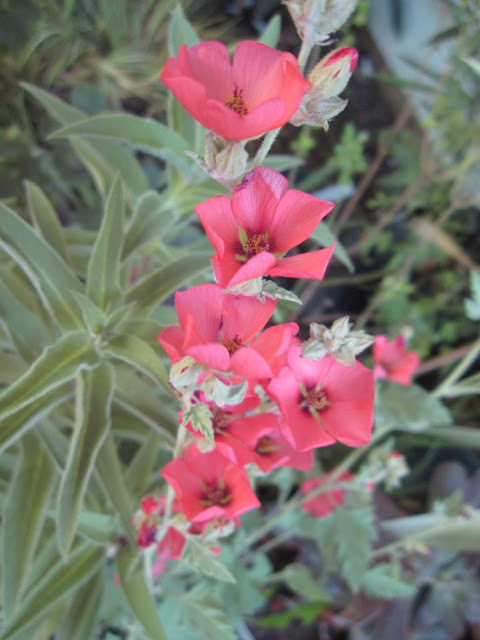 But the florets are pinker on this one. In the same bed, Echinops ritro is blooming with its fascinating spherical flower heads. 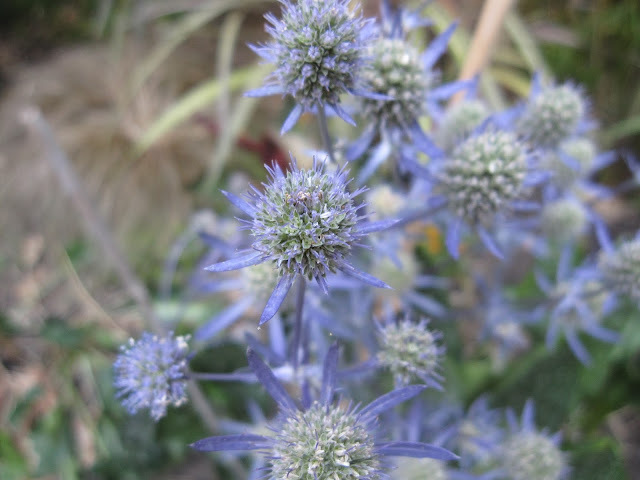 More semi-spheres are represented by Eryngium 'Jade Frost'. 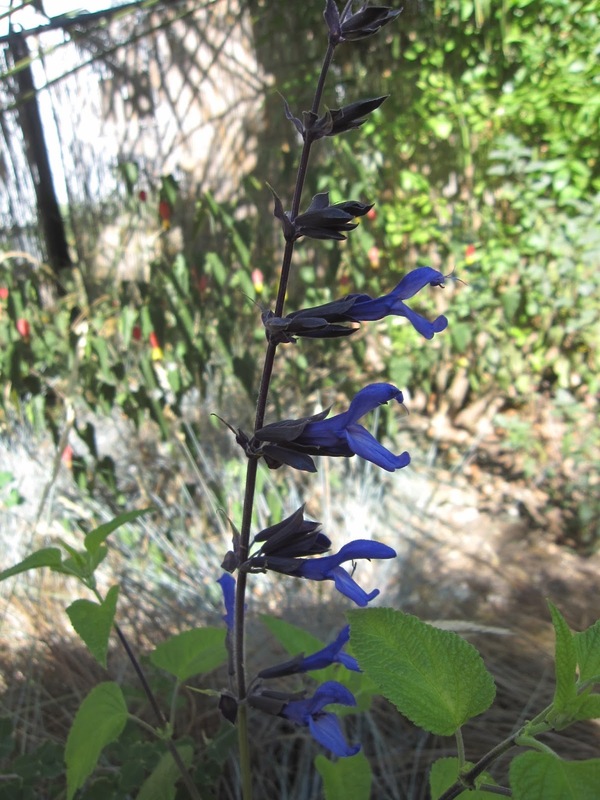 And more blue here in Salvia 'Black and Blue'. Trachelospermum jasminoides is still blooming at the top of the plant. 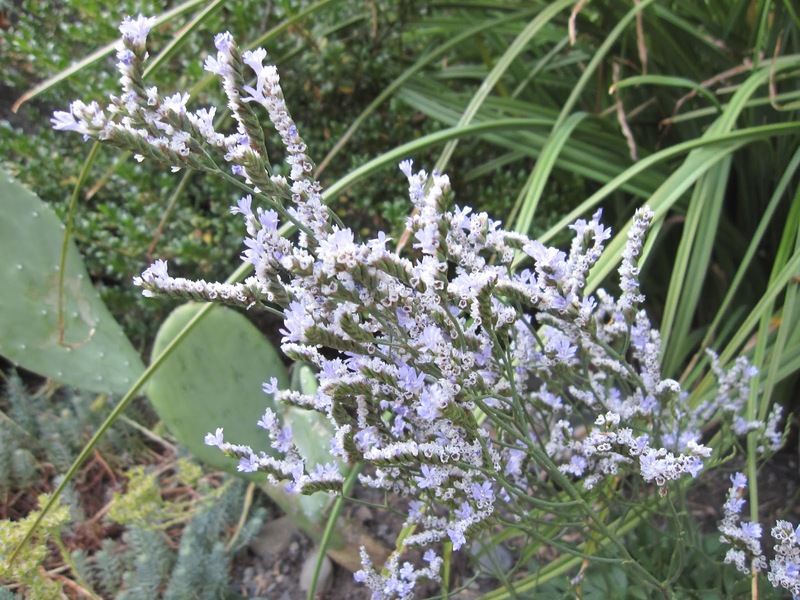 Limonium speciosum 'Blue Diamond' is past its prime, but adds a frothy touch of blue. 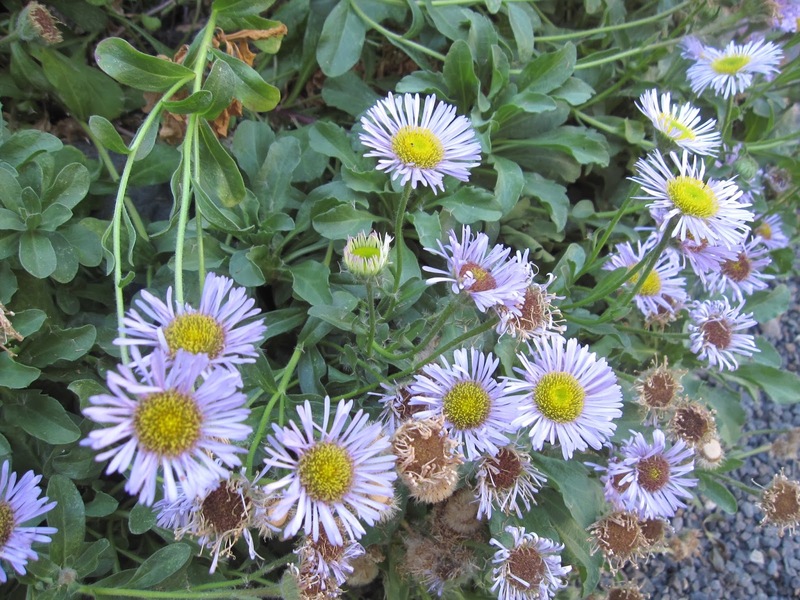 Erigeron glaucas, perking up the Northwest Territory. 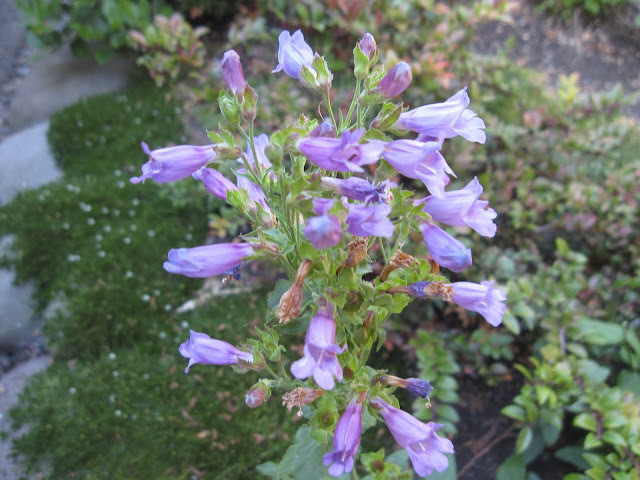 Also in the NW Territory, this native Penstemon that I always ID incorrectly - I'm not even going to try this month. 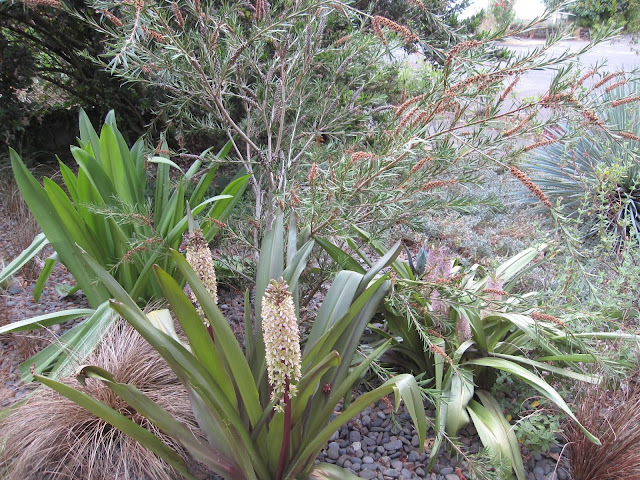 I'll just admire its Hummingbird-attracting tubular flowers. It's not in the ground yet, but I had to include my new Sphearalcea 'Newleaze Coral' from Xera Plants. Such a great color! 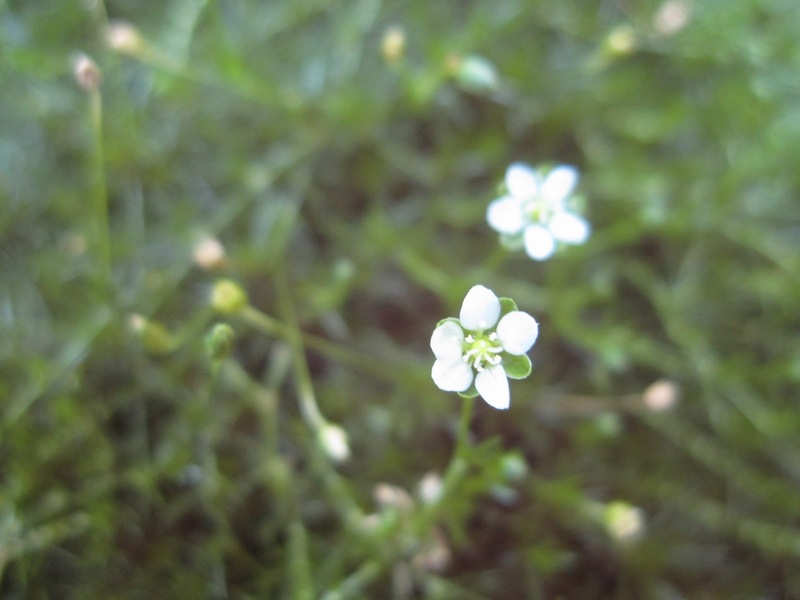 I like how Bloom Day helps me notice the tiny flowers of Sagina subulata. 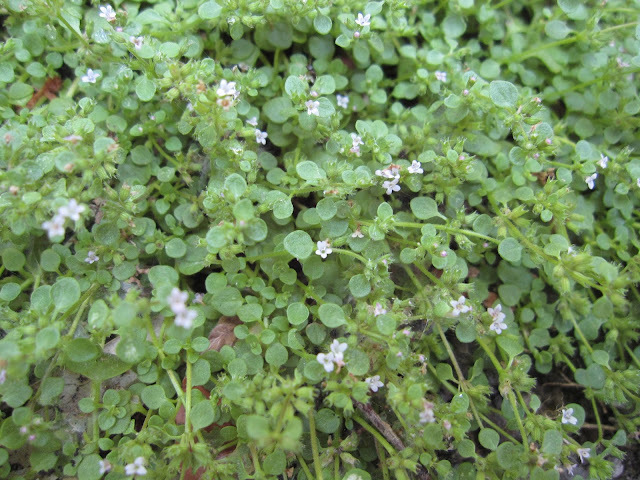 And the even tinier flowers on a volunteer patch of Corsican Mint. Bloom Day is hosted by Carol at May Dreams Gardens. Join her to see a multitude of fascinating blooms from all over this month. I came upon this unplanned arrangement this morning in the Northwest Territory. 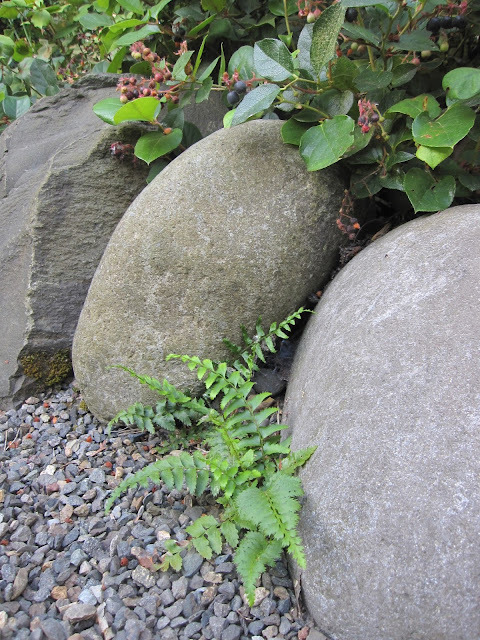 These little Western Sword Ferns (Polystichum munitum) sprouted here below the Salal (Gaultheria shallon) with no direction or assistance from the resident gardeners. How did they manage to locate themselves so perfectly? 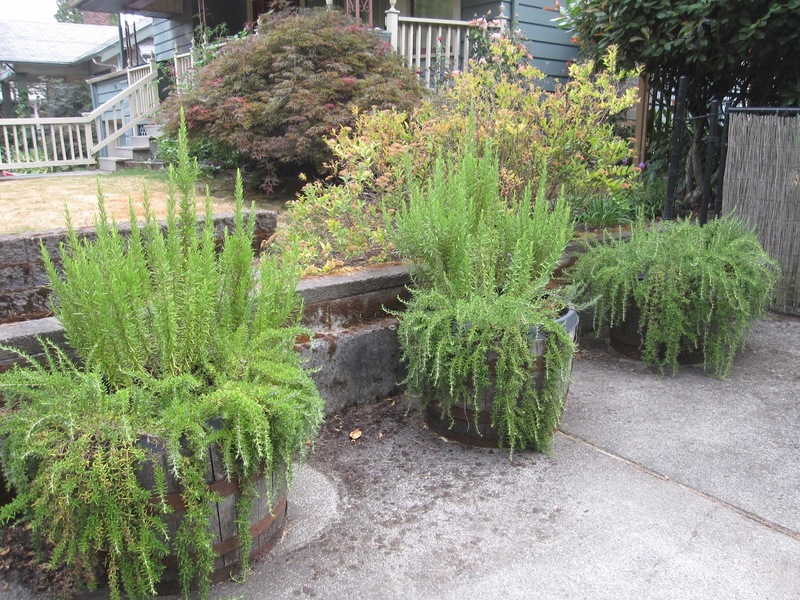 It's an indication of our fruitful Pacific Northwest conditions that, even with the current heat and lack of rain, these ferns happily seed and thrive. And although some local gardeners might consider them almost a weed, we are delighted to let them naturalize in their created habitat. I'm joining my friend Anna at Flutter and Hum for Wednesday Vignette. See what she has posted for today here.